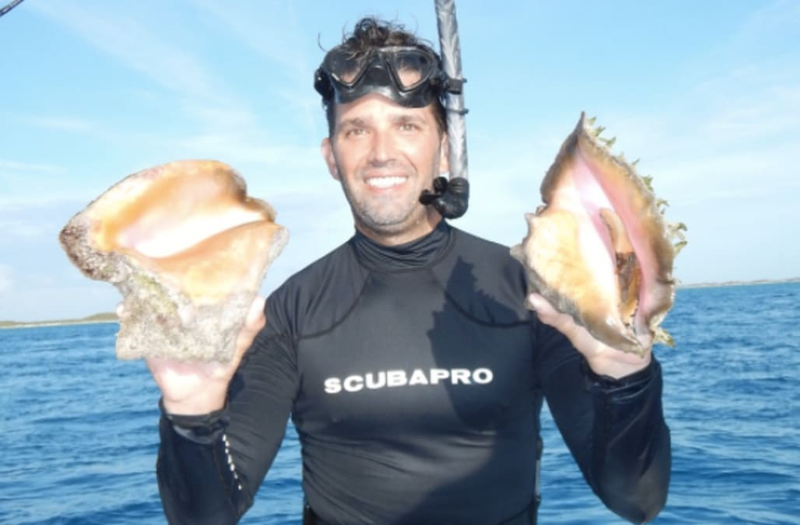 While President Donald Trump and first daughter Ivanka Trump were attending Treasury Secretary Steve Mnuchin's wedding over the weekend, Donald Trump Jr. and his family appeared to be having a great time on a Caribbean vacation. The first son, his wife Vanessa and their children went scuba diving and fishing during their getaway to the Bahamas. Trump posted a photo of his wife and his three youngest children -- 5-year-old Tristan, 4-year-old Spencer and 3-year-old Chloe. His two older children, 10-year-old Kai and 8-year-old Donald III, were not featured in any of his Instagram photos from this year's trip. Trump Jr. and his family are frequent visitors to the Bahamas, having vacationed there several times in the last couple years. Back in Washington D.C., Ivanka Trump, her husband Jared Kushner, President Trump and first lady Melania Trump were spotted at Mnuchin's wedding to actress Louise Linton on Saturday evening. Vice President Mike Pence and his wife Karen were also in attendance.